He is silver Medalist in PGDBM. He was Area Chairman (Marketing) at FORE from 2012-2014. He was Professor-in-charge Alumni relations at FORE for 4 years from 2011-2015. Prior to joining FORE he successfully held various administrative & academic responsibilities as Director, Dean, Officiating HOD, Founder and Coordinator for many new Management Education programs. 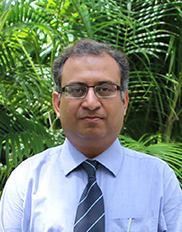 He has taught Consumer Behavior, Service Marketing and International Marketing at reputed business schools in NCR. His research and training areas of interest include Consumer Buying Behavior, Service Marketing, and Indian Higher Education. He has presented papers in various reputed international and national conferences and published research papers and articles in reputed journals, magazines and edited books. He is on the Editorial review board of two International and three national journals. He conducts Management Development and Faculty Development programmes in the area of his expertise. Consumer Buying Behavior, Service Marketing,International Marketing, Indian higher Education and Indian Textiles. 1) Narula A. (2016). Global e- Business Models for Innovative Service Marketing Practices: A Case let of eBay. Amazon and Groupon in Competing through Operations Excellence. J.K Das, M.G Sharma, S. Kaur and A. Kumar (eds.). Bloomsbury: New Delhi. pp 187-201. 2) Narula A., Y. Ahuja and M. Gupta (2016). Changing Paradigm of Online Retail Market: A study of Grofers’ Operational Excellence in Competing through Operations Excellence. J.K Das, M.G Sharma, S. Kaur and A. Kumar (eds.). Bloomsbury: New Delhi. pp 121-133. 3) Narula A., S. Taneja and A. Tyagi (2016). The Changing Trend in Biscuit Consumption Pattern: A Study of McVities Digestive biscuits in Jaipur. Abhigyan Vol XXXIV(2): 26-41. 4) Sharma N. and A. Narula (2015). An Empirical Study Examining the Impact of Greentailing on Store Loyalty in proceedings of 6th IIM Ahmedabad Conference on Marketing in Emerging Economies (eds.) . January 7-9. pp 43-48. 5) Narula A. (2015).Changing Buying Behavior of Global Consumers: A Case let of Italian Consumers in Reviving Italy: Reflections. J.K Das and H. Arora (eds.) Bloomsbury: New Delhi. pp 54-60. 6) Narula A. (2015). An Insight into Uzbekistan’s Cotton Textile Industry. FORE School of Management, New Delhi Working Paper No 06. 7) Narula A. (2014). An Insight into Malaysia’s Medical Tourism Industry in Malaysia: Challenges and Perspectives. J.K Das and H. Arora (eds.) Bloomsbury: New Delhi. pp 168-190. 8) Narula, A. (2014). Retailing trends and opportunities of China’s products in Indian market.Global Journal of Enterprise Information System, 6 (1), 6-12. 9) Das J.K., A. Zameer. A. Narula, and R. Tripathi. 2014 (eds.). Reinventing Marketing for Emerging Markets. Bloomsbury: New Delhi. 495p. 10) Narula A. (2012). Envision toward Academic Quality and Excellence in Indian Higher Education in proceedings of IIT Delhi National Conference on Transformational Leadership. June 28-30.